If your opponent controls a monster in their Monster Zone: You can Special Summon this card from your hand. 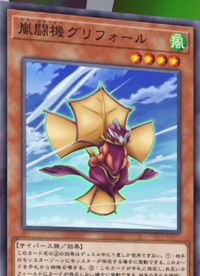 If this card is in your hand and there are no cards on the field: You can look at your opponent's hand, and if they have a Spell/Trap(s) in their hand, Set 1 of them to their field, and if you do, Special Summon this card. You can only use this effect of "Stormrider Griffore" once per Duel. This page was last edited on 6 February 2019, at 18:20.